What is coaching? My coaching is a rewarding way to get the most out of your life and career. Often clients begin working with me while in career transition. A key aspect of coaching is asking you powerful or evocative questions that others do not ask you. Coaching conversations encourage you to say what you have not said, think what you have not thought, dream what you have not dreamt, and say it all out loud in the presence of a collaborative and caring partner. In this environment you begin to see new possibilities, new preferences, and new choices that you can make.Answering those soul-searching and powerful questions leads to choice. You can more easily see that you have the choice of reacting, perhaps in a knee jerk manner, or you have the option of stopping to pause and reflect (which coaching guides you to do) so that you can learn to see what other choices are available to you. This leads to responding rather that always reacting. We become more self-aware and more at-choice. How does it work? The base coaching is weekly 40-50 minute sessions per month. This is supplemented by e-mail coaching at no extra charge, plus the occasional “power coaching call” (5 minutes) as required. You take on as much homework/home-play as you choose, and most of the learning/growth/action/results happen between the calls. How is this different from the advice I can get for free from friends and family? Your friends and family want what’s best for you but they probably don’t have the experience and credentials that a trained professional like my self has. 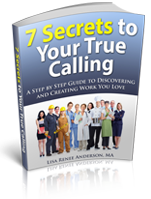 I have studied in-depth the career and life transition process and am up to date on the cutting edge processes that will help you create the life you always dreamed of. You can read more about my experience and credentials here. Do you have any specialties? I specialize in career changes, major life transitions, retirement design and planning, and moving new business ideas into action, and also enjoy working with people to design their ideal lives. Along the way we will set short and long term goals to keep you moving towards your exceptional life. “I spent a lot of time asking myself what I really wanted to do with the rest of my life. After all, I hadn’t thought about those kinds of big issues since college, a decade earlier.This was the first area where Lisa really helped me. I had taken “What Color Is Your Parachute”-type tests before and alway felt frustrated by the results. I’d be left with a list of potential jobs, but I had no idea whether they were really right for me. Lisa helped me draft a description of my ideal job. It’s amazing how closely my new job resembles that description. . . I don’t think I’ll ever undertake another job search without Lisa by my side”. How long would we work together? Some people are done in 3 months, and others are looking for 1-2 year partnerships. I’ve worked with one client for over three years. We’ll normally start with a 3-6 month time frame. I simply suggest my clients stay with me as long as they love the coaching, and the results! Do we meet by phone or in person? It depends. . I work with people all over the country and with an emphasis on Eugene, Portland, Salem, and Ashland, Oregon areas. If you live the Eugene, Oregon area you are welcome to work with me in person or by phone. If you are out of the area we meet by phone. Working by phone really works! I do pick up on subtle nuances in your voice. We both tend to be more focused without visual distractions. You spend less time traveling. We optimize our time together. Is it confidential? All of our communications will remain strictly confidential unless I have your express consent. The exception being that I may share a situation from your coaching as an analogy with other life coaching professionals, in another client’s session, in a newsletter or seminar. Rest assured that I will never use your name nor provide identifying information. What’s your cancellation policy? You may choose to schedule either a regular time that is the same each week, or you may choose to schedule your next session at the end of each coaching call. Either way, once each week is scheduled it may be difficult to find an open time slot. If you need to reschedule, I need at least 24 hours notice otherwise that session will be deducted from your monthly total. In case of an emergency, we will do our best to make up the call by e-mail, fax and brief phone support. Since coaching is based on a monthly retainer or monthly value rather than a “per session” value any weekly sessions that are missed and for which we cannot find a make-up time are not carried over into the following month. I do everything I can to work with people’s schedules plus I am available via phone and email between sessions. It’s like a blanket of support so that you can trust that I am here for you throughout the coaching process. Even if we don’t meet one week you will still have homework assignments and you will notice forward movement towards your goals. What’s the next step to working with you? If you’re ready to make some big, exciting changes to your life, career or business, and are interested in working with me, then fill out the Your True Calling Strategy session form. Make the Decision Today to Have an Exceptional Life today!